Did you know that a traditional Southern Thanksgiving dinner does not include mashed potatoes?? I know...I couldn't believe it either. While serving my LDS mission in South Carolina I discovered this travesty! I'm sorry but in my mind the mashed potatoes make the meal. There is no other canvas sufficient to host the deliciousness of turkey gravy, or to be scooped up with homemade butter rolls. I did however do my part in the conversion process, and not just to the gospel...but to mashed potatoes. Both years I was in the south I made my own mashed potatoes, and convinced many a southern friend that the Idaho spud should not be left off the Thanksgiving table. On that note, I thought I would share with you some of my little tricks and tips for making the most heavenly to-die-for mashed potatoes. It's Thanksgiving after all and some of the things I'm very grateful for...salt, butter, cream and the king of all root veggies...the potato! 1. First you need 5 lbs. Idaho spuds; washed, peeled, and cut into 1" cubes. Here's the first tip; It's very important that you cut the potatoes as uniformly as possible. This allows for a quick and even cooking time. There are some professionals out there who suggest the best way to cook your potatoes are whole and in their skins. They suggest this because it keeps all the starch in the potato. I however feel like this takes too long and often creates an unevenly cooked potato. The true key is not to over cook the cubed potatoes...but I'm getting ahead of myself. 2. Now that you have 5 lb. prepared potatoes, you want to put them in a large stock pot and add cold water to about 1 inch above the potatoes. 3. This next step is one of the most important...you need to salt the water. You need to add enough salt that the water taste like sea water. Start by adding a couple teaspoons, taste your water and continue to add one teaspoon at a time until the water taste right. Why is this step so important? That is a very good question. Salt is not just added to make food taste salty; salt is a natural food enhancer. It brings out the natural flavors of food. Adding salt to the water allows the salt to penetrate the potatoes with a mild salty flavor as well as enhance the yummyness of the potato. No amount of salt you add after the potatoes are cooked will make up for the loss of salt at this point. After the potatoes are cooked, salt will only make them taste...well...too salty! 4. So now we have perfectly cut potatoes, bathing in a cool bath of salted water. We're off to a good start. Next we need to cook these potatoes over high heat until they begin to boil, then reduce the heat to medium and allow to simmer. Here's the next crucial step. Do not over cook the potatoes. You need to stay right by their side and check them ever few minutes until they are just right. I wish I could give you an exact time, but if varies so much depending on the heat of your stove top and the type of potato you use. They could cook anywhere from 10 minutes to 20 minutes. You want to test them with a fork. They need to be soft when pierced but not too mushy or water logged. You want a nice softness with just the tiniest bit of aldente. 5. When the potatoes are done, take them off the heat immediately and drain the water. In a large mixing bowl add 1 C. of melted butter (2 sticks)...yes I said 2 sticks. I didn't say these would be healthy. 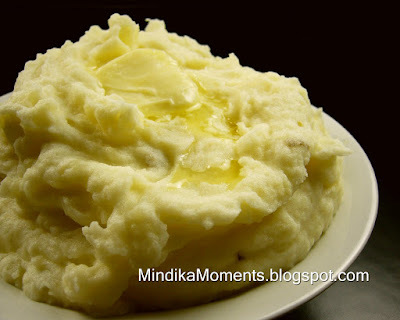 Using a hand masher, start mashing the potatoes, while incorporating the butter. 6. At this point you have a decision to make...lumps or no lumps. I love lumps in my potatoes, but if you don't,you'll need to get out your potato ricer and work all the potatoes through the ricer to create a lump free texture. If you don't have or don't' know what a potato ricer is...click here for more info. If you like the lumps, like me, continue to mash the potatoes with the hand masher until all the largest lumps are gone. Then get out your electric hand mixer and get ready to add more calories. 7. Add to the potatoes, heavy whipping cream in 1/2 C. increments, mixing until you reach your desired consistency. (I will often end up adding 1 1/2 C.) Again...these are not healthy. Thanksgiving is the one time a year that I don't hold back the fat in the potatoes. Ok, I know it's hard to believe, but that's it. Your potatoes should be light fluffy and melt in your mouth. Other's might suggest that you add sour cream or cream cheese, but I'm a simplest when it comes to Thanksgiving mashed potatoes. I just want them to be a beautiful simple canvas for the most incredible turkey gravy. Hopefully I've done an ok job in explaining this process, but if anyone has any questions, don't hesitate to shoot me an email and I'd be happy to answer anything....because everyone should have delicious mashed potatoes on Thanksgiving! Wonderful detailed instructions. I've never used cream, but may have to this year! hooray! sounds just like how my mom makes them...yummy! thank you for writing it down-she just 'does' it-which makes it so hard to copy. i am hosting thanksgiving this year (wish me lots of luck) and will be checking back daily for other great tips-thanks, xoxo. Thanks for such a great post/tribute to the spud! You did a fantastic job in giving step by step instructions.